Christmas becomes a statutory holiday in Iraq for Christians and Muslims. The cabinet has amended the national holiday law following an appeal by Patriarch Sako for whom the birth of Jesus is “for all”. The Vatican Secretary of State is in Iraq where he has called on people to be “seeds of peace”. The government is clamping down on fake property sales that have especially affected Christians. Baghdad – The Iraqi government has approved an amendment to the national holiday law, making Christmas a statutory holiday. The follows an appeal made before Christmas by His Beatitude Card Louis Raphael Sako, who hoped to see Iraq follow other Muslim majority nations like as Jordan, Syria and Lebanon in recognising the birth of Christ. Christians are a small community in Iraq, a country where 95 per cent of the population is Muslim. However, they have played and play a significant role in its cultural, economic and social life. Since the US 2003 invasion, Christians have seen their numbers dwindle, from almost 1.5 million to just over 300,000, mostly Chaldeans and Syriac Catholics. At the same time, he asked Parliamentary Speaker Mohamed al-Halbousi “that a new law be approved” to make Christmas an “official holiday in Iraq […] in consideration of the respect that our Muslim brethren have for Christ”. The Iraqi cabinet responded on Christmas by amending the national holiday law, recognising the day as a statutory holiday. In announcing its decision on Tweeter, it expressed its best wishes of “Merry Christmas to all our Christian citizens, to all Iraqis and to those who celebrate it in the world”. For their part, Christians across the country went to Mass and gathered together as families in an atmosphere of renewed trust and relative calm. To mark the improved situation, Pope Francis sent his right-hand man, Secretary of State Cardinal Pietro Parolin, on an official visit to the Middle Eastern country from 24 to 28 December. 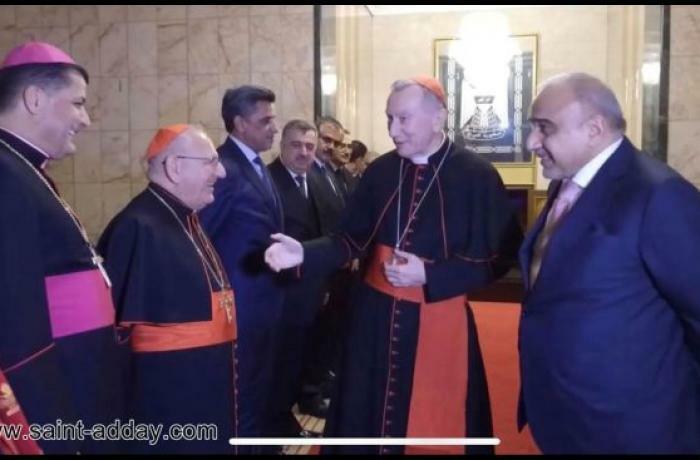 After visiting the capital, where he concelebrated Midnight Mass and met government leaders, including President Barham Salih and Prime Minister Adil Abdul Mahdi, the prelate travelled to Erbil and the Nineveh Plains, last stop on his trip. In his message, the Vatican Secretary of State said that “as individuals and communities” Christians and Muslims are called to sow “the seeds of peace, truth, justice, freedom and love”. Meanwhile, Iraqi authorities have recently taken steps to stop the seizure of Christian-owned assets in the country, especially those owned by people who fled abroad to escape violence and persecution. One of the measures now requires that the transfer of ownership be witnessed by the (Christian) owner in person at the land registry in order to stop fake sales, which have left thousands of people deprived of their property.